One can not say enough about the investments and commitment to quality instituted by Haut-Bailly’s new American owner, Robert Wilmers, the head of the huge M&T bank conglomerate. The chateau’s entire staff, headed by the talented Veronique Sanders (the granddaughter of one of the great gentlemen of Bordeaux, Daniel Sanders), reflects both enthusiasm and dedication. Powerful, fruit-driven, and big, the 2003 exhibits a deep ruby/purple color along with a sweet perfume of lead pencil shavings intermixed with red and black currants, cherries, and forest floor. Boasting beautiful purity, medium to full body, and admirable glycerin as well as textural weight, it is an elegant, classic Bordeaux to drink between 2008-2020+. Tasted at Bordeaux Index’s “10-Year On” tasting in London. 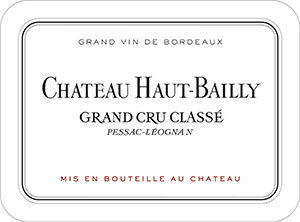 The 2003 Haut Bailly has a ripe raisin, fruitcake and leather scented bouquet with just a hint of eau-de-vie developing with time. The palate is well balanced with firm, ripe rounded tannins and very good volume. It is low in acidity as one would expect, but there are attractive earthy, gamey notes towards the finish that lend it some character. It just seems a little smudged compared to other vintages and there is a charred note on the aftertaste. Tasted March 2013.